Love is in the air! 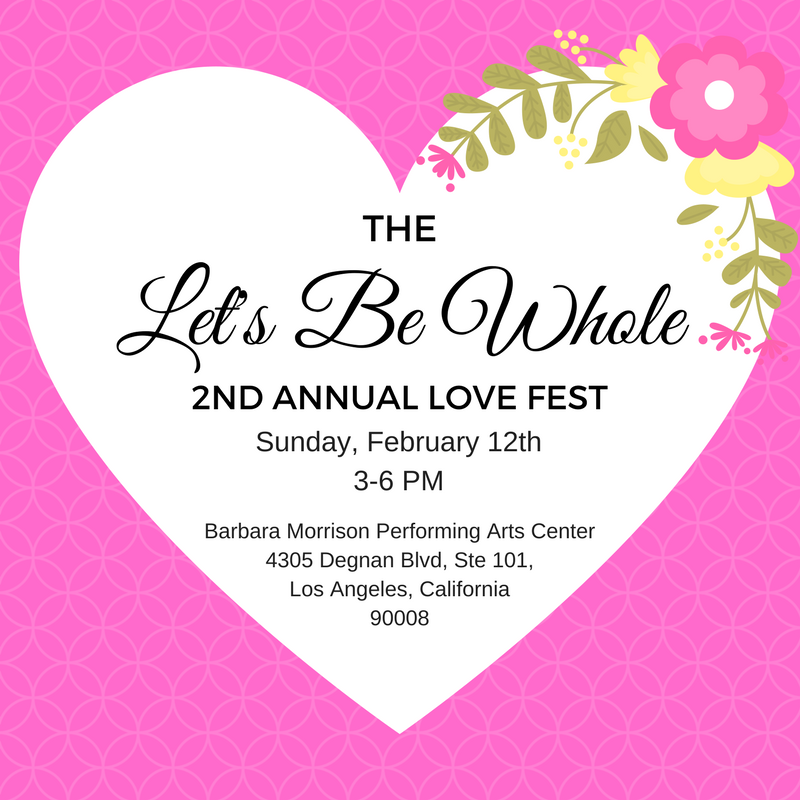 Join me and the Let’s Be Whole show at the 2nd Annual LOVE FEST! Come celebrate it with us on Sun., 2/12 from 3p – 6p as our three guest panelists share their expertise in three distinct areas of love. Spend an afternoon with some of Los Angeles’ top experts in the fields of love, passion, and romance. Hosted by Let’s Be Whole Co-Hosts, Nina Womack and Angel Aviles, there will also be live entertainment, healthy food, love-related vendors and much more! Celebrity match- maker and author of, ‘Why Married Men Cheat’, Danielle Metcalf, known as “Ms Hitch,” introduces her Mental Toughness technique as a ‘must know’ approach to love. Who doesn’t want more romance?!!! Barry Selby is the author of “50 Ways To Love Your Lover.” A passionate champion for the feminine, Barry Selby has a series of talks called “Messages From The Masculine.” You’ll love the insight he can provide because this passion consultant is the go-to guy for building amazing and authentic relationships. Vibrant Singer, Actress, Inspirational Speaker, Jacqueline Oya Thomas, M.A. had penned a practical self-love guide called the “5 Star Points for Success.” Her book is designed to help anyone with a creative dream, live an exceptional life grounded in the five core components of self: MIND; BODY; SPIRIT; EMOTIONS, and ENVIRONMENT. Whatever your relationship status, you will be empowered to have the best 2017 ever! Sunday, February 12th from 3 to 6 pm at the Barbara Morrison Performing Arts Center. This is a donation-based event but we are suggesting at least $5.00 which will go to covering event production costs. Email [email protected] or call (877) 594-1292 for additional info. We are so blessed to be able to log on to our computers and access some of the best minds in the world. 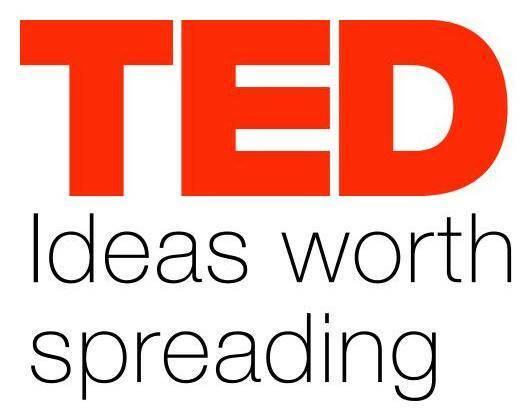 TEDTalks shares the best ideas from the TED Conference with the world, for free: trusted voices and convention-breaking mavericks, icons and geniuses, all giving the talk of their lives in 18 minutes. There is a fresh TEDTalk posted every weekday. 1. First up on this list of inspiring TEd Talks is the amazing woman Dame Stephanie Shirley a.k.a. the most successful tech entrepreneur you never heard of. Her story is profound and her delivery is eloquent and fun. She is a MUST watch. 2. Gary Vaynerchuk says the Internet has made the formula for success simpler than ever, so there’s now no excuse not to do what makes you happy. Watch this if you still struggle with self doubt. 3. If you thought GaryVee offered a talk on having no excuses, check out Maya Penn! She started her first company when she was 8 years old. At 16, she is an entrepreneur, a philanthropist, an artist, and the CEO of her eco-friendly fashion company. 4. Next up we have one of my favorite TEd Talks on entrepreneurship. Navi Radjou shares the BRILLIANT acomplishments of entrepreneurs with limited resources. Radjou also shares three principles for how we can all do more with less. 5. Okay, I will admit to getting a little teary eyed on this one. I’m just going to quote the part that got me and you’ll know why. “If you see the word “microfinance,” what comes to mind? Most people say women. And if you see the word “entrepreneur,” most people think men. Why is that? Because we aim low and we think small when it comes to women. Microfinance is an incredibly powerful tool that leads to self-sufficiency and self-respect, but we must move beyond micro-hopes and micro-ambitions for women, because they have so much greater hopes for themselves.” Watch Gayle Tzemach Lemmon share her inspired report on women and econmics.